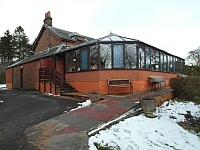 Services / facilities within the building include a puppet theatre, cafe, gift shop, picnic and play area. 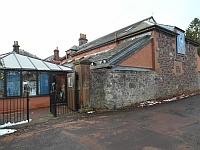 The nearest National Rail station is Carstairs. 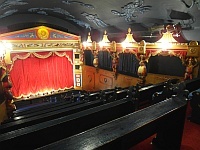 Please contact the venue for details of opening times and opening times do vary depending on performances. 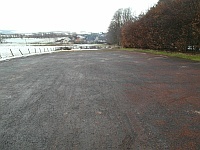 The car park is located at the rear of the venue. There is/are 0 Blue Badge parking bay(s) within the car park. 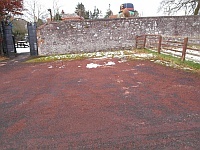 The car park surface is loose chippings. Drop-offs can be made at the side gate adjacent to the accessible entrance. This information is for the entrance located to the rear of the building. The width of the door opening is 126cm (4ft 2in). 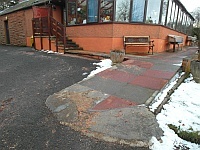 The ramp/slope is located on the path leading to the entrance steps. There is not a level landing at the top of the ramp/slope. The step(s) is/are located to the right as you face the entrance. There is/are 5 step(s) to the area/service. 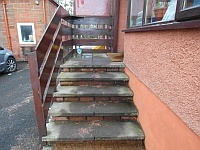 There is not tactile paving at the top and bottom of the steps. The handrail(s) is/are on the left going up. The ramp/slope does not bypass the step(s). This information is for the entrance located at the side of the building. 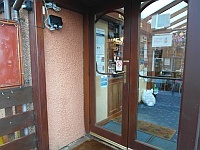 The width of the door opening is 95cm (3ft 1in). 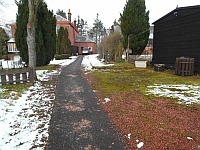 The ramp or slope is located on the path leading to the entrance. 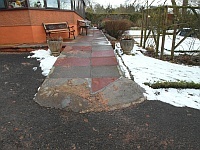 The ramp from the rear can by bypassed using the side gate. 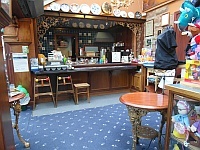 The desk/counter is 14m (15yd 11in) from the accessible entrance. 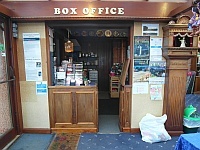 There is level access to the desk/counter from the entrance. The desk/counter is medium height (77cm - 109cm). The desk/counter does not have a low (76cm or lower) section. You are on Theatre. Skip to the next section. There are designated spaces for wheelchair users. 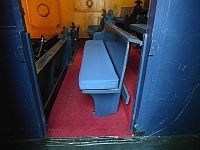 Designated seating is located Row D, accessed from the foyer. 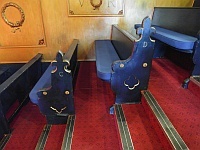 Wheelchairs are left with the patron. A companion may sit with you. Companions sit next to you. 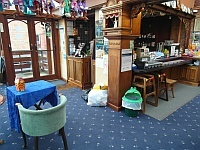 It is 8m (8yd 2ft) from the designated seating area to the nearest accessible toilet. This venue does not provide audio described performances. There is a wheelchair to borrow. Assistance dogs are allowed in the auditorium. 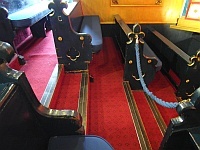 The seating shown in photograph 1 is removed for wheelchair users. 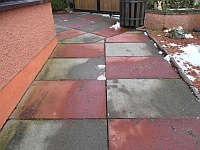 A custom built platform can also be added to cover the 2 steps down from this row for more space. Steps to other rows are clearly marked. Signed performances may be available by prior arrangement. 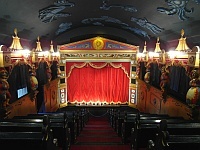 Subtitled performances are also available by prior arrangement. There are UV lighting puppets which have been found helpful to people with visual impairments. 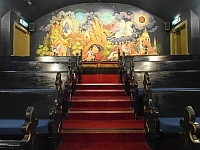 You are on Level Change (Rear Theatre Entrance). Skip to the next section. 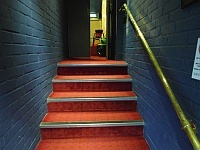 The step(s) is/are located leading up to the rear of the theatre entrance. There is/are 7 step(s) to the area/service. The lighting levels at the step(s) are low. The handrail(s) is/are on the right going up. 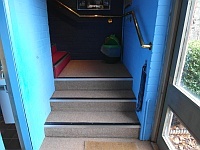 The entrance to accessible seating can be used to bypass the steps by arrangement. You are on Eating and Drinking. Skip to the next section. 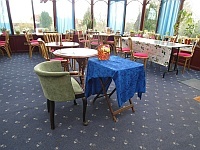 The following information is for the café. 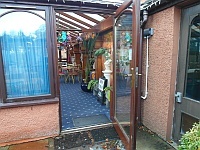 The café is located in the rear conservatory. Full table service is available. 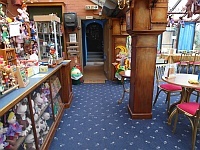 The nearest table is approximately 4m (4yd 1ft) from the accessible entrance. 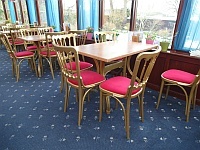 The distance between the floor and the lowest table is 67cm (2ft 2in). 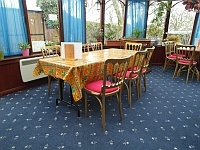 The distance between the floor and the highest table is 72cm (2ft 4in). There is ample room for a wheelchair user to manoeuvre. Plastic / takeaway cups are available. Plastic / takeaway cutlery is available. Menus are hand held only. Menus are not available in Braille. Menus are available in large print. Picture menus are not available. Menus are presented in contrasting colours. 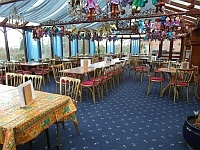 The type of food served here is hot and cold meals and snacks. 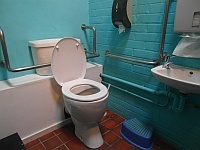 This accessible toilet is approximately 10m (10yd 2ft) from the accessible entrance. 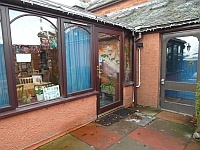 The accessible toilet is located to the right as you enter. The width of the accessible toilet door is 75cm (2ft 6in). 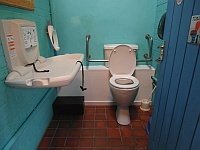 The dimensions of the accessible toilet are 151cm x 167cm (4ft 11in x 5ft 6in). There is not sufficient turning space in the cubicle for a wheelchair user. The lateral transfer space is 70cm (2ft 4in). There is no dropdown rail for the toilet. There is not a mixer tap. There is not an emergency alarm. There is a/are open waste paper bin disposal units. Mirrors are not placed at a lower level or at an angle for ease of use. 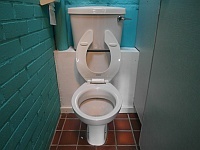 The height of the toilet seat above floor level is 53cm (1ft 9in). The toilet roll holder cannot be reached from seated on the toilet. The height of the toilet roll holder is 105cm (3ft 5in). Baby change facilities are located within the venue. Baby change facilities are located in the accessible toilet. The height of the baby change table once extended is 90cm (2ft 11in). 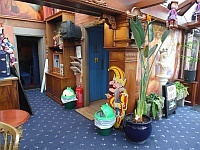 The female and male toilet facilities that were surveyed are located to the right as you enter. 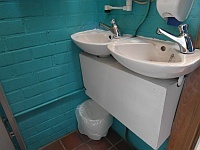 The female and male toilets are approximately 8m (8yd 2ft) from the accessible entrance. 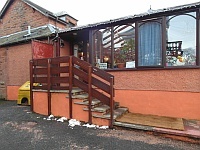 Staff do not receive disability awareness / equality training. A bowl of water can be provided for an assistance dog. 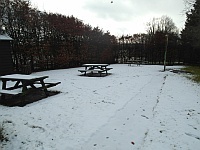 The assistance dog toilet area is located at the side of the car park. 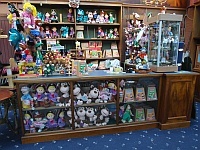 Touch tours are available for some of the puppets. 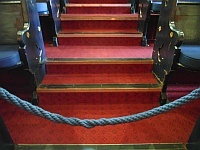 The venue requests a 1 week advance notification for visitors with mobility issues. Visitors with mobility issues are requested to be at the venue 10 minutes prior performance time.